Kids love chocolate milk. Generally, as a parent, your choice has been either pasteurized conventional milk (whole, 2%, or skim) with overly processed chocolate syrup or pasteurized organic milk (whole, 2%, or skim) with overly processed chocolate syrup. None of these options, in my opinion, are acceptable. I believe I have a healthier chocolate milk choice. 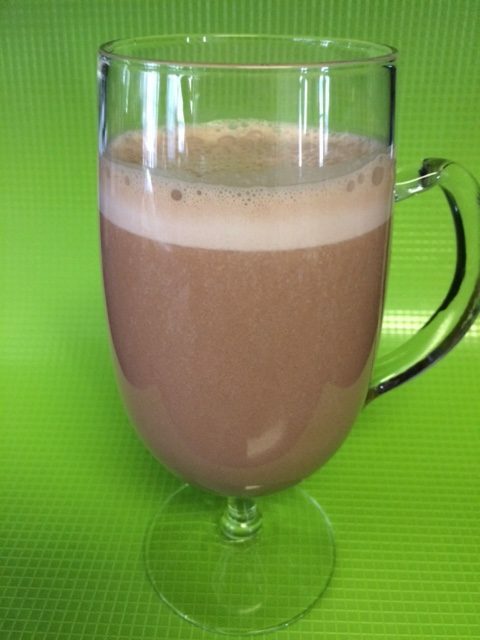 I use coconut milk, raw cacao powder, raw honey, and a pastured egg yolk. If you and your family can tolerate milk products, you could use raw whole milk (unpasteurized and unhomogenized). Try it for yourself. Then, get the real thumbs up from your kids. My recipe has more calories than conventional chocolate milk, but the calorie sources are healthier than those from conventional chocolate milk. I use full-fat organic coconut milk, but you could substitute it with “lite organic coconut milk” to reduce the caloric load. As I mentioned above, you could use raw milk if you and your family can tolerate casein and lactose. Pour for yourself and your child. Enjoy!